The Hebrew University of Jerusalem (Hebrew: האוניברסיטה העברית בירושלים‎, Arabic: الجامعة العبرية في القدس‎, abbreviated as HUJ or HUJI) is Israel's oldest university. One of the visions of the Zionist movement was the establishment of a Hebrew university in Palestine. Founding a university was proposed as far back as 1884 in the Kattowitz conference of the Hovevei Zion society. A major supporter of the idea was Albert Einstein, who bequeathed his papers and entire estate to the university. The cornerstone for the university was laid in 1918, and, seven years later, on April 1, 1925, the Hebrew University campus on Mount Scopus of Jerusalem was opened at a gala ceremony attended by the leaders of the Jewish world, distinguished scholars and public figures, and British dignitaries, including Lord Arthur James Balfour, Viscount Allenby and Sir Herbert Samuel. The university's first Chancellor was Judah Magnes. By 1947, the University had become a large research and teaching institution. Plans for a medical school were approved in May 1949, and in November 1949, a faculty of law was inaugurated. In 1952, it was announced that the agricultural institute founded by the university in 1940 would become a full-fledged faculty of agriculture. During the 1948 Arab-Israeli War, the Arabs repeatedly attacked the university, located to the northeast of Jerusalem, and convoys moving between the Israeli-controlled section of Jerusalem and the university. 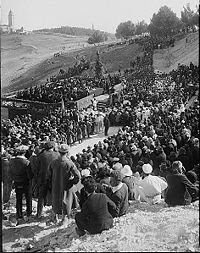 After the attack on the Hadassah medical convoy in 1948, the Mount Scopus campus was cut off from Jewish Jerusalem.When the Jordanian government reneged on the 1949 Armistice Agreements and refused Israeli access to the Mount Scopus campus, the University was forced to build a new campus in Givat Ram in western Jerusalem, which was completed in 1953. In the interim, the university rented part of the Terra Sancta building in Rehavia from the Franciscan Custodians of the Latin Holy Places and held classes there. A few years later, together with the Hadassah Medical Organization, a medical science campus was built in the Jerusalem neighborhood of Ein Kerem in southwest Jerusalem. By the beginning of 1967, the students numbered 12,500, spread among the two campuses in Jerusalem and the agricultural faculty in Rehovot. After the reunification of Jerusalem in the Six-Day War of June 1967, the University was able to return to the Mount Scopus campus, which was rebuilt. 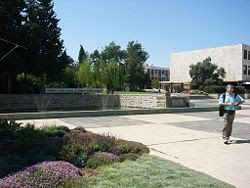 In 1981 the construction work was completed, and the Mount Scopus campus again became the main campus of the university. 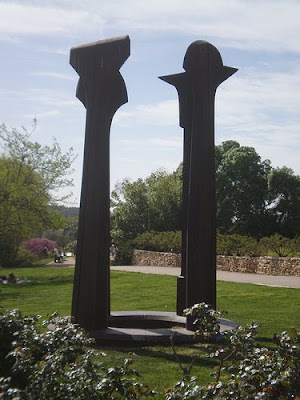 The university was again touched by conflict on July 31, 2002, when a Palestinian construction worker (a resident of East Jerusalem) exploded a bomb in the university's crowded Frank Sinatra cafeteria during lunch time. Nine people — five Israeli citizens, three American citizens, and one citizen of both France and the United States — were killed by the explosion and many more injured. Hamas claimed responsibility for the attack. World leaders including Kofi Annan, President Bush, and the President of the European Union issued statements of condemnation. 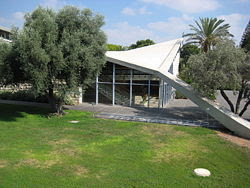 Rehovot Campus houses the Faculty of Agricultural, Food & Environmental Quality Sciences, School of Nutritional Sciences and the School of Veterinary Medicine. The Hebrew University is open to all academically qualified applicants, regardless of nationality, race, creed, color or religion. Studies are offered on the undergraduate, graduate and doctoral levels and postgraduate diploma programs.